I suppose a problem with leaving a post on a cliffhanger is that one then creates an air of expectation for the following story. Especially when at the end of the previous story one uses words like ‘love’, and ‘falling in’, and ‘woman’. Words that now probably have led to images of me spending five days tucked away with a beautiful Italian, frollicking by the lakes, completely smitten. And by continuing the story, I now have to tell the truth, a truth that will smash any such conception. Thus I’m left wondering if perhaps I should’ve just done a ‘lock, stock, and two smoking barrels’ and left this blog there on that cliffhanger, ending the whole story on a note of suspense, and leaving the rest up to the immagination of the reader. Instead I fear I’m doing a ‘matrix 2’, and in doing so not only making a largely dissapointing follow up, but in dissecting it’s surrounding mystique, also managing to ruin the first one and all the hard work that went into making it. 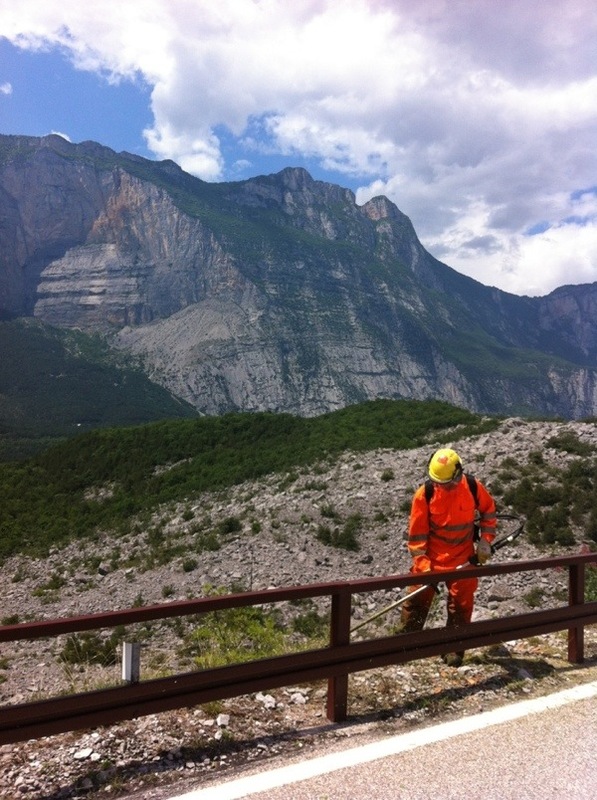 There were big things on my mind that morning I woke up after Riva Del Garda. The most pressing big thing being an abondonded hotel I’d noticed the day before; a cool, old building that projected out of the lake’s surrounding rockface and over the water. I stopped straight away by the side of the road lining the lake on the evening when I first saw it, and I wondered if I could be able to traverse the cliff with my sleeping bag slung overarm, scale the hotel, and pitch up there for the night. I fantasised about this for about 20 minutes, but in the end chickened out, and I remember cycling off feeling very disappointed myself. Still being only 4 days into the journey, it seemed the spirit of adventure had not grown strong enough for such a task. The dissappointment stayed with me the next morning. I tried to leave Riva del Garda, but the hotel began eating at my insides more and more with every metre that I cycled further away from it. 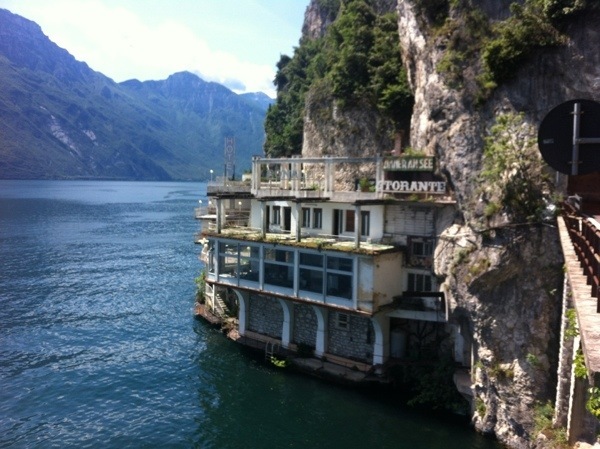 It seemed a part of me had acknowledged that traversing a cliff, then jumping off the cliff into the lake, then scaling an abandoned, rusty hotel, and then jumping off the top of that hotel into the lake, was an activity that scared me quite a lot. But more importantly, this part had acknowledged that it was an activity that deep down I really wanted to do. I think this side of me grew sick at the idea of not doing something that I truthfully wanted to do just because I was afraid. What a bore fear is, how many things it stops us from doing. Refusing to pander to it’s confines, I turned around and cycled 4km back to the hotel. I found a cliff face about 70m away from it, and went to a spot about 10m above the lake, which I could jump off from and into the water. Bathing in the sun, and my blood swimming in adrenaline, I counted 1… 2… 3… And then, boom! The realisation hit me that I’d just counted 1,2,3 for the 25th time and still hadn’t jumped so probably wasn’t going to do it. Instead, I turned around and found a rock about 5m high and jumped off that… (hey, I didn’t know if it was safe to jump off the last one, how deep it was, if there were rocks, who knows, maybe turning round saved my life that day). Once in the water I of couse had to face my other lifelong fear. Sharks. And by this I don’t mean I actually confronted a shark, I just mean the idea of them. Yes, it was a lake, I know there are no sharks there. Or at least probably, I did a degree in science so if there’s one thing I know, it’s that we as humans don’t know everything. But I can be mildly afraid of sharks in swimming pools, when I was really young, I was even afraid that one lived underneath my bath (really young /2 years ago). So I spent the next five minutes swimming to the hotel, trying to take my time, trying to pretend to myself that I was completely calm, trying to convince myself how ridiculous it is to not feel calm, how ridiculous it is to feel anything but gorgeous while in the middle of this sunny lake in the middle of Italian paradise. And although I achieved this latter feeling from time to time, there was always a mild sense of panic and fear, and it saddens me greatly that at almost 24 years of age this ridiculous quasi-phobia still has not left me. In fact, I even fear it’s got worse. I really hope by the time I leave Italy, it may have changed. The railings of the hotel felt old and rusted. I enjoyed the sense of risk as I trusted my bodyweight onto them while scaling the hotel’s side. Vines had wrapped themselves round many of the structures, and I loved my ancient playground as I hopped from one platform to another. I felt like an explorer as I walked into the old rooms, and I immagined how it may have looked in the 1940s, how the people would’ve dressed, how the porters would’ve carried the bags. In one room I was surprised to find a new-ish suitcase that seemed recently used, containing some clean clothes and a towel. I was wet so used the towel, and while using it pondered if someone had done what I had planned on doing the night before and then had never left. I let out a few ‘Ciao’s in an effort to find my hermit, but nobody appeared. An old chair on the terrace beckoned me over and I sat into it deeply, my whole body relaxed as it absorbed the sun’s warmth and I pretended to myself that this was my own private house and terrace, my own little holiday get away. How happy I was for those 20 minutes. How tranquil I felt. And thus how startled I was when a huge f*cking alarm suddenly went off that sent me flying off my chair and almost burst my eardrum. In a fluster I sprinted to the side of the hotel and jumped off from the top of the second floor, and then as soon as I had departed and landed in the water, oddly enough this alarm instantly stopped. I’d seen some security cameras and this made me then wonder if the alarm had been pushed by someone observing a security camera feed, and this would explain why it’d stopped as soon as he’d seen me exit (in dramatic hollywood fasion I might add). If so, what a boring job, to have to just sit there all day and watch an abandoned hotel. And also if this were the case, then how did our hermit get away with staying there? Maybe he’s the one in charge of security. The conspiracy thickens. Google maps provided me with three routes up to my next destination, and I picked the second (a significance I’ll come back to later). After having dried in the sun, and having waiting for a few cuts to stop bleeding that I’d acquired climbing up the cliff face back to my bike, I mounted up and headed off. It was still only 11am, I felt like I’d done so much, and if there’s one thing this trip’s beginning to teach me it’s that mornings are a beautiful thing and I should try and sieze them more often. Some older kids used to call me Gopher at secondary school everday on account of my oversized backpack and buckteeth, though it seems perhaps only now I am realising my destiny of being the eager beaver that I’d always meant to be. My morning cycle took me through to the afternoon and some mountains took me to another beautiful lake, with a beautiful cafe by it’s side, and two beautiful Italian girls by the cafe’s side. I grabbed a panini, and being the smooth Italian English player that I am, went over and started a conversation. It’s easy to fall in love with foreign girls. If they’re pretty. I think it’s because you don’t really understand anything they are saying to you, while the language sounds so exotic, and you’re left assuming that whatever they said must’ve surely been as beautiful as the person saying the words. You can watch them speak to you, staring into their eyes, with no idea what they’e saying and love every goddamn second of it. Then when they speak you’re language and say something boring or a joke that’s not funny, you just let them off, assuming it was probably a language barrier thing. Thus like this, these sirens can never ruin their image of perfection. One of the girls I met, the beautiful Michaela, invited me to come to the bar she worked at later because she wanted an ”English lesson”. I put ”English lesson” in quote marks because that’s sort of what I assumed was the case when she asked me, but now after 4 days of time together, I think she actually just really wanted an English lesson. There was no alterior motive. I met some other guys while at the bar who brought me beers all night and even chipped in some money towards staying at a hotel there, because I’d been talking about how I don’t like spending money on hotels. I actually felt really bad about this since they were hardworking labourers, while I was earning more than they make a day in the one hour of work I had to do each day in Milan or in the 2 hours I had to work a day in that mansion in Tuscany. But I couldn’t refuse them because they were very forceful with their hospitality, unless maybe I told them about my earnings, but then I don’t like doing this because I feel I put a wall up between the people I meet and me. I’m not really sure, it’s a moral dillemma, opinions anyone? That’s an actual question, please spare some thoughts if you have any. But back to Michaela and life in the village. I stayed in that hotel for the next four nights. And although I had to pay 30 euros a night to stay here, I was then given a free breakfast by the hotel owners each day, free lunch at a cafe by my new pal Davide who worked there, and then would go over to someone’s house for dinner and drinks each evening. Aside from hotel costs I’m not sure if I spent even 5 euros in those four days. Additionally Davide liked that I used to be a snowboard instructor, which is his profession in the winter too, and I hope this winter I’ll be able to take him up on his offer to live with a couple of weeks and go shreddin the gnar together (Canadian snowboarding term, super lame). Life was pretty good. All day I’d sit on a rock in the sun by the lake, reading my Italian grammar book, and every so often chatting to the people that I’d met who would occassionally come down to the lake for a little bit to enjoy the sun. Then the early evening would come, and Michaela and I would have our English lesson at the bar she worked at. How much I loved listening to Michaela speak English. She would always insist that I corrected all her mistakes, but I never wanted to. I preferred her broken grammar and her strange phrases that didn’t technically make any sense, but yet I always understood. I didn’t want to turn her into just another English speaking English person, and so, often I’d just let her mistakes slip and tell her that she spoke everything perfectly. Once Michaela finished work, we’d usually go for a drink and some food at a friend’s house, before heading out to some event or party. It seemed in this community of towns, within this community of lakes, there was always some excuse in the evening for all the people from each town to get together and drink beer. Usually a football tournament, which despite sometimes 100s of people turning up for, you wouldn’t find many people actually watching the game. I’d then get driven to some other bar, or in one case a party in the forrest, and then eventually be driven back to my hotel. I was amazed at how friendly everyone was to me, it was truly one of the nicest placest I’ve been to in my life. And when you fall in love with the scenery, it’s easy to fall in love with the girl that you’ve met there. The girl who knows everyone, who knows all the places, who knows what to do. And of course here I use the word love very loosely, with her it was naturally more of an infactuation than any form of true love. Though there was still however a love that I felt, but this love was not necessarily for her, but perhaps more for the idea of her. For the idea of settling down in this friendly and beautiful place in Italy, this idea of staying there and going out with one of the most beautiful girls in the whole community of towns, of becoming a part of the life of this place which I had taken to so strongly. This seemed like the whole point of going away to cycle somewhere, that you stop in a small village somewhere, meet the sweet and rural girl of your dreams, and then struggle with yourself about continuing the journey or not. But the more I spoke to Michaela, the more I learnt about her, and the more I realised how the reality differs from the fantasy. She’d had a really hard life. Her father worked all day in the fields, while her mum had passed away five years ago, leaving a baby brother for Michaela to have to look after herself. They’d never had any money, and Michaela once told me a story with such conviction about the passionate pleasure she received from playing a nintendo wii one time, something to her that seemed an item of such luxury. Something to me that just lies with the rest of my consoles, barely used, and barely cared about. I started to feel that Michaela and I were of different worlds, I started to understand also why she was a bit asexual in her nature, as for her, it was her family and her survival that came before boys and relationships. Perhaps if I’d stayed longer in this town, Michaela and I could’ve been together. In fact, in some ways I felt she was spending the four days sussing me out, seeing if she could trust me, if I could indeed be a boy in her life. However, the more time we had together the more I began to feel a little guilty about the love and the fantasy I had. For her, what I came across was her life, was her trying to get by, was her doing what she could for her family. For me, this whole thing was like a game, a fantasy that sat with the kinds I had when I thought up this whole adventure. Something that I could take or leave, something that interested me, perhaps even just something quirky that I could talk about with my friends one day. I began to feel like I had no right, nor true reasons, for claiming the thing that I was trying to pursue. In the end I had to go because I was called back for another stint of work in Milan, and I’m not sure if I’ll return when I finish work again. I didn’t want to leave when I left, but that’s always the best way in which to leave somewhere. And this whole story above, these whole four days, and all the many things that happened in those days that I haven’t mentioned, they all happened because I took the route 2 on google maps. 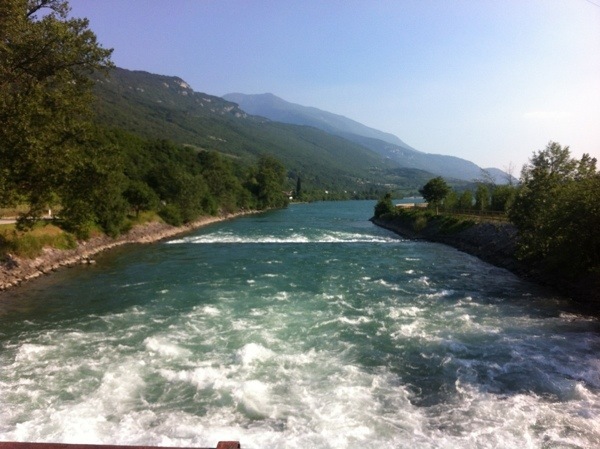 This entry was posted in Fast Women, Italy Travel Adventure Cycle Blog and tagged Adventure Cycle, Beautiful lakes, Italian Village, Italy Travel blog. Bookmark the permalink. Also, I think you should have refused money from those labourers. Bella Amico… ‘Monday, Tuesday, Thursday, Wednesday, Friday, Sunday, Saturday’. That hotel looked amazing! Don’t beat yourself up, I probably wouldn’t of been able to jump off either and so would a large majority of people. Plus I had exactly that same fear of sharks in the pool when I was younger. Still worry about things grabbing me from the depths and their not always thoughts of sharks. Damn you old B horror movies!! I will have my revenge.